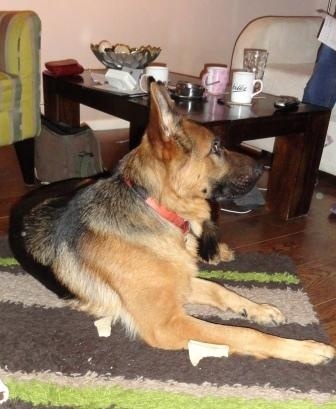 Shandy is a fourteen month old German Shepherd, a friendly dog who in the circumstances is unbelievably stable. Not only does he lack any sort of boundaries, he is actively taught to do the very things that should be avoided. It is a tribute to his great personality that he is not aggressive or fearful – or both. In fact, I have very seldom watched while someone behaves in such an inappropriate way with their dog. That they love Shandy goes without saying. He is adored. At the same time he is not treated with respect, and he is encouraged to show his humans no respect either. They may tell him to do something, but he takes no notice and they give up. He does exactly what he wants. Shandy jumps up at them, he jumps all over them, he jumps up at visitors, he stands on the sofa pawing the man to share sweets with him; he literally walks all over them. He is encouraged by teasing kind of play to mouth and bite hands and feet. While his owners are eating he will be staring, drooling and pawing so that they share their food with him. On walks he is a problem. The only way they can handle him and stop the pulling is by using a Halti. He lunges and barks at cats and shows aggression to dogs he doesn’t know. This is hardly surprising. Outside in the big world he is trapped, attached by his lead to a man who is an unpredictable responsibility not a leader, or to the sensible young daughter who is very frustrated by the whole situation and who contacted me in the first place. She however is slight of build and unconfident when out with Shandy and he will sense this. Needless to say, off lead he only comes back when he is ready. I can see Shandy’s behaviour taking a turn for the worse as he matures if they can’t somehow quite drastically change their ways which I fear they may not wish to do. He is a powerful dog. He does not need a silly playmate nor a servant. He needs to be taught good manners. He needs responsible ‘parenting’. Shandy is, quite literally, being spoilt – ruined. Yesterday I visited another pair of large dogs that are wonderful in the house but who are giving the lady owner problems out on walks. Kaiser and Boodie are most unusal and stunning to look at. 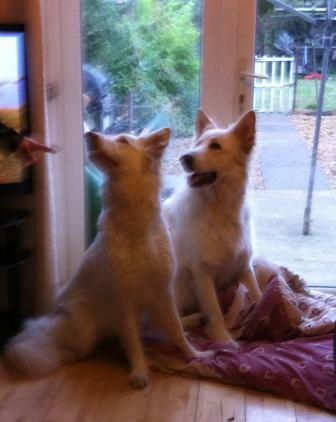 They are young cream-coloured German Shepherds, both in their third year. 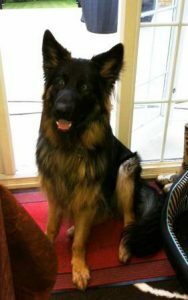 Their experienced German Shepherd owners have given their dogs a perfect mixture of love, discipline and socialisation. Unfortunately, the man is now no longer fit enough to walk the dogs, so it is his wife’s job. It is such a shame when a dog that used to absolutely fine with other dogs is attacked by one. Sometimes ‘life happens’. An off-lead Staffie went for Kaiser back in January and since then he has become very wary and reactive to any dog he feels might be aggressive, especially if they bark or make a noise. The lady was naturally very shaken after this attack and came home in tears. So, in addition to coping with being attacked, Kaiser also had his owner’s weakness to deal with. It is so often the case that when the dog most needs our calm strong moral support, we go to pieces. The same thing happened to my own Shepherd Milly a while ago. A Staffie leapt over a wall and went for her. Because due to my experience I wasn’t fazed I reacted calmly and knew what to do. I stood talking to the gentleman owner for a few minutes. On our way back past that wall Milly was unconcerned. Fortunately, thanks to her long coat she was more or less unharmed. Sadly, it is often Staffies who are the culprits, and this is nothing to do with the fact they are Staffordshire Bull Terriers. It is to do with the type of owners who choose them. 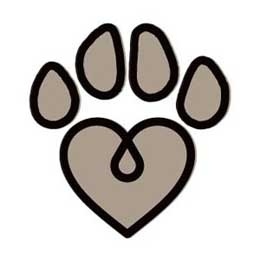 This I know is a gross generalisation so I humbly apologise to the kind of SBT owners who would be reading this, but too often they are owned by people who don’t use leads and whose way of disciplining their dogs is very harsh, and too often they are not bred carefully for temperament. I have met many wonderful Staffies. Anyway, my client is a lady who last weekend was pulled over and dragged along the ground by her two dogs when Kaiser lunged towards a dog he didn’t like the look of, backed up by Boodie. The lady has a cut face and injuries to her arm and legs. She needs help. Previous walking has depended upon the man or the son being strong and the use of choke chains. The lady needs these dogs to walk beside her through choice and for Kaiser not to be on the defensive, so she needs different equipment and to learn a completely different walking technique. Home life with these two dogs is harmonious in every other respect, but now that they have this problem the lady will need to gain stronger leadership so that Kaiser doesn’t feel he is in charge, needing to protect her and himself from other dogs, looking to her instead. My photo doesn’t do justice to Caesar at all. He is a 16-month old GSD with a wonderful temperament. He is a good example of a dog that is well-trained, he knows and obeys many commands and hand signals, but when it comes to something important like not jumping onto people, not pulling on lead and barking at horses (the rider could be thrown) he chooses to do his own thing! A typical teenager in fact. The walk experience is not as relaxed and pleasant as it should be. Imagine a dog’s discomfort when pulling against a choke chain collar (‘choke’ being the operative word), being held on a tight lead and constantly corrected, when with a bit of work he could be walking beside his owner like there was no lead at all through his own choice. Advice from ex-police type trainers usually advocates the use of choke chains and dominance because those dogs are being trained for something that isn’t being simply a family pet and companion. I was in time to stop the owners buying a pinch (prong) collar – that was their next step in trying to stop their big dog pulling. These gadgets are about humans forcing their will upon the dog, not about the dog happily complying because he wants to. Do we really want to do this sort of thing to a wonderful, gentle natured dog – or to any dog in fact? Walks don’t start outside the door. They start at home with general leadership skills so that the dog is calm and predisposed to cooperate. In a way it’s a lot more effort as gadgets can seem like a quick fix, but people I go to call me out because they love their dogs, and putting in some time and work is not an issue. They just need to be shown what to do. An owner may feel it’s OK being jumped on and obeying the dog’s demands in the house, but it’s not really good for the dog’s ‘upbringing’ if he’s to mature into a respectful, trustworthy adult that can be taken anywhere. Along with his being given the notion that he is the decision-maker come responsibilities of leadership – including leading the way when out on a walk. By some simple modifications in the behaviour of the humans, the behaviour of the dog can change radically over a period of time. The bottom line is, if we want the behaviour of our dog to change, then we need to change our own behaviour. ‘If you do what you’ve always done, you get what you’ve always gotten’ (anon). Holly is a German Shepherd with an impressive pedigree of champions – and with very big ears! A beautiful girl. She has been well trained by careful and caring owners. I was called in to see them because of Holly’s reactivity to other dogs when she is on lead – seemingly changing character, snarling, lunging and acting scary and I saw her react in a similar way when the paper boy put the newspaper through the door. She is also very protective of her home territory which is a breed thing anyway but she is a bit extreme. She patrols the boundary of the property which is surrounded by a footpath, barking frantically if the person has a dog. The lady feels she no longer is strong enough to walk her so the man is the dog walker. He was already making progress before I came, and being more confident than the lady he lets Holly off lead and has discovered that, off lead, Holly is a different dog. She may be a little wary of a dog and drop down, she may run wanting to play, she investigates and she will come away when called. Like most people who phone me, they start off by listing their dog’s good qualities, feeling disloyal when they start to list problems. It is very common for me to hear ‘she is no trouble at all at home – it’s only out on walks’. As with Holly, I usually discover that there are relevant issues at home. Her good points indeed far outweigh any negatives. However, she persistently jumps at people whether they are sitting or standing, especially visitors, and she gets in quite a panic at people going past with dogs, the postman and even squirrels. Holly is a good example of where training alone doesn’t provided the answer. For example, she understands No and Off but she will jump up again if she feels like it. Holly’s recall is usually good and she has been trained to ‘come’, but she will ignore it if she is boundary barking. She could possibly be stopped with a training gadget like an air collar – but this wouldn’t get to the root of the problem. It would be a quick fix and probably make things worse – like a plaster keeping a festering wound out of sight. It is the same when they encounter other dogs. No amount of ‘training’ would stop her feeling as she does. This is a psychological behavioural issue requiring calm, patient and consistent leadership – not commands. German Shepherd Tasha was happy to see me when I arrived as she is with all people. When her new owners inherited her about four months ago she would jump up, but no longer. Tasha is similar to other two dogs I’ve most recently visited in that she is fine at home, good with people, but not so good with other dogs out on walks. When this is the case I can usually bet that before even encountering other dogs things aren’t going as well as they should. The dog will not be walking on a loose lead, sniffing and doing doggy-walk things. She will be pulling and she will be on the alert. A tight short lead gives no freedom and a retractable/extendable/flexi lead that is never loose will only compound the problem. 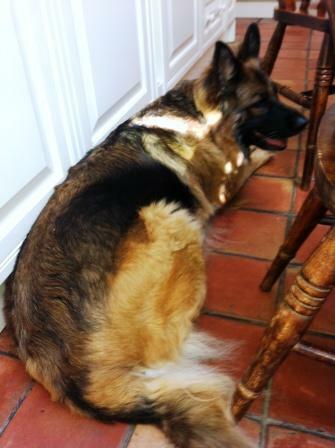 The owners had their previous two German Shepherds from puppies but Tasha is five years old. They were taken by surprise when she suddenly lunged and snarled at another dog. It seems likely that in the past Tasha was seldom walked on lead. She lived happily with another Shepherd. A dog on lead she is trapped and can’t freeze or flee, and there is a good chance that if she were free she would be quite OK with other dogs. Naturally they can’t test that yet. From that first lunge the lady owner in particular is scared and won’t walk Tasha alone any more. The gentleman holds the lead short and tight as soon as they spot another dog, irrespective of whether Tasha might be OK. They are in effect telling her that all dogs mean trouble, and Tasha will be reacting accordingly. It is a vicious circle. Tasha now wears a Halti head collar which she tries to remove. Walks are increasingly stressful for both Tasha and her owners. Once again we humans need to see things from the dog’s point of view and react appropriately. Firstly, in all areas of life, in behaving like leaders the will give Tasha the opportunity to make the right decisions because she wants to please, rather than having them imposed upon her. For instance, instead of charging out of the door first at the start of the walk, she will work it out for herself that the door simply won’t open for her until she hangs back so they can go out together. The same rule applies to pulling down the road. She will work it out for herself over the next few days that she will only progress anywhere when the lead is loose (which is easier than it sounds so long as handlers stop all ‘correcting’and ‘training’ ). Without walking out calmly and nicely and without then walking happily on a loose lead, Tasha is going to be in a stressy state of mind when she is confronted with possible trouble – other dogs. Finally they will work towards being able to trust Tasha to come back when called, so that she can be off lead. I am pretty sure other dogs will then seem far less of a threat to her. 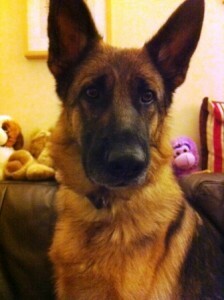 Sasha is very similar to my Milly in temperament. Both are German Shepherds and neither had the best start in life. Sasha was found dumped in a park in London at about 5 months old, and Milly was in a puppy farm until she was three months old. Neither had been properly socialised at the most crucial times in their lives for encountering a variery of new experiences and people – between six and twelve weeks of age. Like Milly, Sasha is excellent around other dogs which indicates that both lived their early weeks with dogs though lacked kind and gentle human contact. Sasha is very wary of people, rushing up and barking at them when she is out and scared and barking if they come into her house. She was quick to make friends with me because I put no pressure on her, and she could sense her owners weren’t anxious either. They knew I could look after myself! 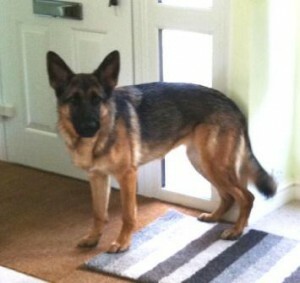 Apart from when fear overtakes her, Sasha is biddable and well behaved both at home and when out on walks. Her recall is excellent and she walks off lead a treat – staying nearby. Because of her reactivity to people walking towards her, she now has to be walked on lead, so her walking nicely without pulling needs some work.